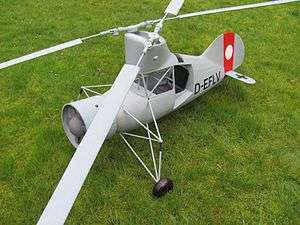 The Flettner Fl 265 was an experimental helicopter designed by Anton Flettner. This helicopter, developed in 1938 with the support of Nazi Germany's Kriegsmarine, made it possible, for the first time, to transition from powered rotary-wing flight to autorotation and back again, making it the safest helicopter of its time. In contrast to the Fl 185, the Fl 265, believed to be the pioneering example of a synchropter, had two intermeshing rotors 12 m in diameter, powered by a 160 hp (119 kW) BMW-Bramo Sh 14 A radial engine in the nose of the fuselage, fitted with a fan to assist cooling. Six helicopters were constructed, but series production was curtailed in favour of the Flettner Fl 282. ↑ Green, William (2010). Aircraft of the Third Reich. Vol.1 (1st ed.). London: Aerospace Publishing Limited. pp. 328–329. ISBN 978 1 900732 06 2. Green, William (2010). Aircraft of the Third Reich. Vol.1 (1st ed.). London: Aerospace Publishing Limited. pp. 328–329. ISBN 978 1 900732 06 2. Wikimedia Commons has media related to Flettner Fl 265.